2015 Honda CRF50F. Picture credits - Honda. Submit more pictures. The CRF50F offers up an unbeatable combination: Its bulletproof engine develops smooth, easy-to-use power, a three-speed transmission with automatic clutch, and a tough suspension that stands up to youthful enthusiasm. And for adults, the CRF50F makes sense too: an adjustable throttle limiter lets you tailor the power to the appropriate skill level, and the proven reliability means more time riding and less time taken up by maintenance and repairs. 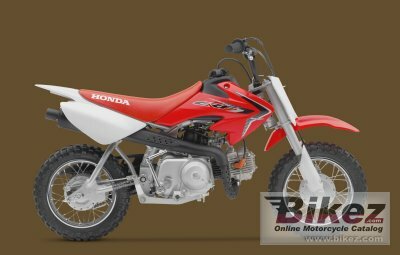 Ask questions Join the 15 Honda CRF50F discussion group or the general Honda discussion group. Bikez.com has a discussion group for every motorcycle. Here you may find answers to common questions about the model. If you do not find what you are looking for, you can ask questions. Try out the 2015 Honda CRF50F discussion forum. You can sign up for e-mail notifications when other users answer you. If you have information about any technical issue related to this motorcycle, please leave a comment for other riders.